This year marks the 150th anniversary of Mahler’s birth and 2011 the centenary of his death, so expect the torrent of Mahler recordings to become a flood. Medici Arts have trumped the opposition with this long-awaited Tennstedt/LPO release, which includes an overture and an all-too-brief interview with the ailing maestro. The latter was taped in 1990, three years after ill-health forced Tennstedt to step down as the LPO’s music director. Happily, though, he and his band were soon reunited for some memorable concerts; this live Mahler First is one of them. Tennstedt’s partnership with the LPO was a remarkable one, producing some fine concerts and a complete Mahler cycle for EMI. The latter wasn’t a total success - Tennstedt wasn’t happy with the LPO First from 1977 and recorded it again with the Chicago Symphony some years later - but the live events were another matter entirely. London concertgoers were treated to an electrifying Fifth (HMV Classics) and a triumphant, barnstorming Eighth; the latter was issued on DVD, coupled with that Chicago First (EMI 3 67743 9). 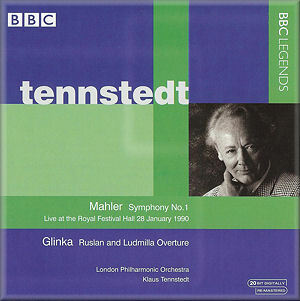 Although Tennstedt’s studio recordings of Mahler are generally acceptable they lack the visionary quality of his live performances. The Chicago First - recorded in 1990 - is a case in point, combining new-found authority with the warmth and humanity he invariably brought to these scores. And while it’s not perfect - it could be a little tauter at times - it’s a world away from his more tentative studio version. There are a number of excellent recordings of this symphony, among them Leonard Bernstein’s live Concertgebouw account (DG 427 303-2) and James Levine’s under-rated one with the LSO (available as a special order from ArkivMusic). Of the more recent recordings David Zinman’s - review - has a freshness and clarity that is most appealing. As for Jonathan Nott’s - review - it’s just too wilful and uneven to warrant a recommendation from me. No doubt there will be more Firsts this year and next, making the job of finding an ideal version even more difficult than it already is. Back to the BBC Legends disc and it’s clear from the first bars that this is going to be a riveting First. True, the mysterious opening is a little more clear-eyed than, say, Tennstedt’s studio version, but here the music positively thrums with tension, the soft timps adding to the sense of unease. The all-important horns are beautifully caught, the recording warmer and more detailed than usual from this venue. The playing is wonderfully assured and transparent, the Wunderhorn loveliness of this movement superbly realised. Tennstedt phrases with obvious affection - the cuckoo has seldom sounded so startling - but where others are apt to loosen the reins Tennstedt holds them tight, alive to every shift of pace and direction. One senses that the conductor has a much surer grasp of the symphony’s overall structure than before; his tempi are well judged and the ebb and flow of this movement is artfully maintained. The orchestra simply play their hearts out, the horns sounding suitably burnished as our wayfarer steps from gloom to glade. Indeed, there’s a radiance to the music-making that’s all too rare in this symphony, and it’s clear from the buzz in the auditorium that the audience thinks so too. And although the recording was made in January there’s no sign of the serial coughers and emphatic throat-clearers who usually ruin concerts at this time of year. The waltz-scherzo dances with the best of them - the basses buoyant and well articulated - and one marvels anew at the sheer propulsive energy of this youthful score. More importantly, this music is fleet of foot as well, the waltz served with just a hint of schmaltz. But then Tennstedt slams the door on this whimsical world and plunges us into the next with a suitably spooky rendition of Frère Jacques. True, this may lack the shiver-up-the-spine quality that a carefully managed studio recording can sometimes provide, but it’s atmospheric enough. In fact, the wall-eyed character of this music is conveyed most convincingly, the funereal bass drum thuds especially effective. Happily, Tennstedt ensures the various parts of this movement dovetail naturally, with none of the ‘parenthesising’ that disfigures Nott’s reading at this point. The shriek that opens the final movement is as elemental as one could hope for, those jabbing rhythms positively terrifying. Despite this the recording full and weighty throughout, with no hint of roughness or constriction. The bass drum and snarling brass are especially prominent, though not artificially so, and when this nightmare ends a deep sense of exhaustion ensues. The reviving LPO strings really sing here, their lovely phrases naturally shaped, not self-consciously moulded. Again one feels Tennstedt is very much in control, guiding and coaxing, his eye firmly on that final peroration. And, goodness, what a blazing triumph it is, as exhilarating as I’ve ever heard. The appreciative roar of the RFH audience says it all. I would have been more than happy just to have the symphony, but the fizzy overture to Glinka’s Ruslan and Ludmila proves Tennstedt was more than capable of turning his hand to something rather different. More closely recorded than the Mahler, it’s still weighty and detailed. And even if it lacks the exaggerated zap and zing of those ‘Russian Spectaculars’ it’s dispatched with pin-sharp precision and a real sense of elan. The 1990 interview with Tennstedt, while welcome, is also rather distressing. The throat cancer that eventually killed him had all but destroyed his voice, making it difficult to understand him at times. That said, there’s an unmistakable warmth and passion in his answers, not least his belief that illness gave him a new and profound insight into Mahler’s death-shadowed world. Other than that there are no revelations, the veteran John Amis as sensible and sensitive an interviewer as one could wish for. A poignant piece, but for a more fitting epitaph to this much-missed maestro look no further than this Mahler. It’s a deeply penetrating, once-in-a-lifetime performance and, despite a very faint hum in quiet passages, it’s well recorded to boot. In fact, it’s gone straight to the top of my list of recommendations for this much-loved - and much-recorded - symphony.